A naturally occuring makeover on the surface of Saturn's largest moon is erasing thousands of craters that pockmark the surface which scientists were using to determine its age. NASA researchers made the discovery from observations made by the Cassini spacecraft, sent to explore the neighbourhood surrounding the ringed-planet back in 2004. According to NASA's findings, the craters on Saturn's moon Titan are slowly being filled in with hydrocarbon sand, which seems to be coming from some sort of methane source. "Most of the Saturnian satellites – Titan's siblings – have thousands and thousands of craters on their surface," said Catherine Neish, of NASA's Cassini radar team. "So far on Titan, of the 50 per cent of the surface that we've seen in high resolution, we've only found about 60 craters." Neish said her team made the discovery after comparing craters on Titan with those of Jupiter's moon Ganymede. The two moons both have an ice crust, which in theory, should have meant they shared similar crater shapes. "We found that craters on Titan were on average hundreds of metres shallower than similarly sized craters on Ganymede, suggesting that some process on Titan is filling its craters," said Neish. "This suggests a process like windblown sand, which fills craters and other features at a steady rate," said Neish, explaining why Titan's are being filled. But what still has Neish and her team puzzled is the source of methane that is contributing to the sand's formation. 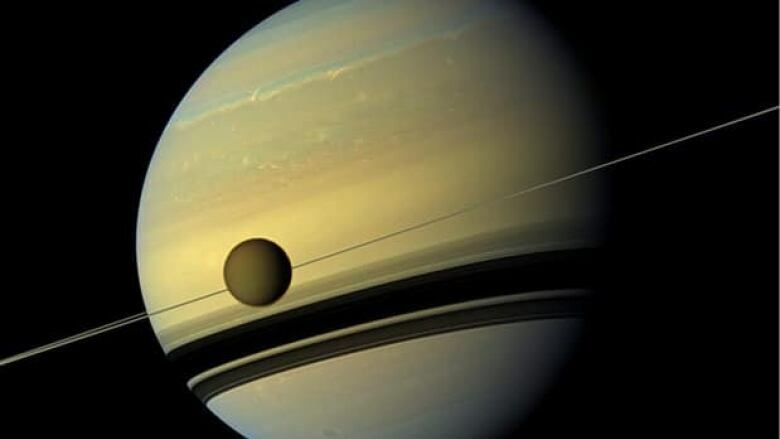 The researchers said that methane, which typically breaks down quickly in sunlight, is forming into more complex hydrocarbons in Titan's upper atmosphere. Larger particles then rain onto the moon's surface and bind together forming the sand. "Since the sand appears to be produced from the atmospheric methane, Titan must have had methane in its atmosphere for at least several hundred million years in order to fill craters to the levels we are seeing," said Neish. The other option might be that Titan either has more methane in its atmosphere then previously estimated, or has some way replenishing it now. To date, Cassini has provided data covering approximately 50 per cent of Titan's surface, and within 30 degrees of its equator. The spacecraft is on a multi-year tour of Saturn and its moons. The caption on this story previously identified Titan as a planet. It is actually a moon.